Australian pokies players can score thousands of dollars’ worth of free spins, bonus cash and more at our top-ranked and recommended real money casinos, which we play at and test regularly to assure they’re the safest options for international Internet gamblers. We look at how and where you can find the best AUD pokies promotions online in 2016. Note: 32Red no longer services Australian players, this information is for international players only. $250 Daily Freerolls – This free pokies tournament is one of 32 Red’s most famous innovations. Play for a $250 guaranteed prize pool on Microgaming’s hugely popular Avalon slot, but without having to risk a cent of your own cash. Tourneys run 24 hours a day, seven days a week. Ruby Tuesday – Every Tuesday of every week, you can earn double loyalty points on selected real money pokies at 32 Red. To find out which games qualify, see the ‘Specials’ menu on the Red Ruby Rewards page in the casino lobby. Throw in a $10 no-deposit bonus for all new players, everyday Red Ruby Rewards on all real money casino games and an outstanding customer service network, and it’s no surprise that 32Red.com was named ‘Casino of the Decade’ for 2000-2009. New players can also take advantage of $32 in matched deposit bonuses for every real money deposit of $10. 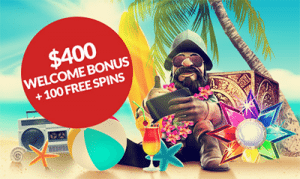 $400 sign up bonus – new players who sign up and deposit real money can claim up to $400 in welcome bonuses, deposited to your account over your first four real money deposits. You’ll also score 100 free spins to use on Starburst, one of the most popular online pokies games from Net Entertainment. Double Deal Monday – make a deposit on a Monday and enter the code ‘DOUBLE’ to receive a 40% matched deposit bonus up to an amount of $40. If you deposit and wager at least $20 on Monday, you’ll also find 15 free spins on selected pokies waiting in your account on Tuesday. Thursday Triple – deposit and play-through at Guts on Thursday and you’ll receive free spins to use on the pokies for Friday, Saturday and Sunday. If you deposit between $20 and $49, you’ll get 10 free spins each day (30 free spins all up), or deposit $50 or more and you’ll receive 20 free spins each day of the weekend, that’s 60 free spins in total. On top of these ongoing bonuses, Guts is well known and loved by pokies players for its one-off, exclusive promos for registered players. Sign up at Guts.com to stay in the loop of new bonuses for Aussie players. $1200 sign up bonus – new players can claim a giant $1200 in matched deposit bonus, spread out in instalments of $400 over your first three real money deposits. Everyday 100% Loyalty Rewards – Royal Vegas gives you full loyalty points on every single Microgaming slot in the casino. So if you bet five cash credits on any pokie, you get five rewards points. This awesome loyalty program runs all day, every day. 10% deposit bonuses – make your first real money deposit using selected web wallets like Neteller or Skrill and collect an additional 10% bonus. Combine generous offers like these with the new one-off promotions appearing daily, weekly and monthly and it’s easy to see why RoyalVegasCasino.com remains such a trusted and popular option for Australian pokie players. Note: Thrills no longer services Australian players, this information is for international players only. With 500+ games from 14 of the world’s best software developers, Thrills Casino is one of our absolute favourites for desktop and mobile pokies, table game and live dealer games. It’s also a great place to go chasing bonuses, as ‘Real Cash Free Spins’ at Thrills feature no wagering requirements whatsoever. That means you don’t have to play through your bonus balance a certain number of times to clear it, and all winnings are counted as real money credits – no confusion, no hassle. AUD $100 Welcome Package – All new players can get a 100% matched bonus of up to $100 on your first real money deposit, along with further matched deposits over your subsequent three deposits. All up, you can claim $400 in bonus money, plus you’ll receive 20 free Super Spins, which are free spins valued at $1.00 per spin. Thrills Bonus-O-Metre – This is a unique rewards system where you can earn extra spins by winning bonus rounds in selected online pokies. Bet $0.40+ per turn on NRVNA, Wild Rockets, Dracula, Flowers, and Jack and the Beanstalk to unlock seven treasure chests containing up to 200 free spins. Want to claim one of the best casino bonuses on the web? Sign up at Royal Vegas Casino to score up to $1200 in matched deposit bonuses as a new player.